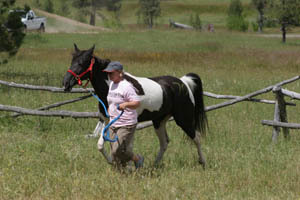 If you want to experience the true flavor of multi-ethnic endurance riding, Bandit Springs in central Oregon is where you go. You've got your Equi-Ethnic Majority: the Arabians. 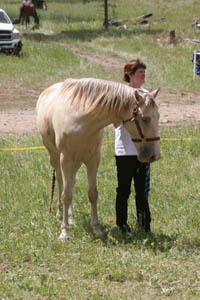 Then you've got your Equi-Ethnic Minorities, a large percentage of which are 'Gaiters' - your Tennessee Walkers, Paso Finos, Peruvian Pasos, Missouri Foxtrotters; there are also minority Mustangs, Quarter horses, Morgans, Thoroughbreds, Irish Thoroughbreds, Standardbreds, Rocky Mountain horses, and the colored Appaloosas and Paints and Palominos; and there's the half-breds and unknown-breds that are a mix of all kinds of breeds. And they pretty much all get along. (The one thing I didn't see was a mule, but I bet they'll come out of the closet soon!) I enjoyed trying to guess breeds, then asking the rider if I was correct. Then you have your wide range of people: Exclusively Gaiter riders and non-Gaiters (a friendly rivalry there); first time riders and veterans with 20,000 miles under their fanny packs; 10-year-olds to 72-year-olds; international competitors to weekend fun riders. You'll see huge motorhomes pulling 3-horse trailers, 5-horse trailers with living quarters, and the basic old-truck-and-2-horse-trailer-and-tent. Not only that, you have your choice of about a dozen rides over two days: a 10-mile trail ride, 30 miles, 50 miles, 80 miles, or a 100 miles (or a 2-day 100), and the 50-mile Region IV AHA Championship. If you're crazy, you can ride a 100 on day 1 and a 50 on day 2. If you're REALLY crazy, like nearly a dozen people were, you can do a Ride & Tie, either 10, 30, 50, 80, or 100 miles of it! And somehow, we all fit together. My non-horsie friend came to watch on Saturday and perceptively observed: "This endurance riding is a Culture all its own!" 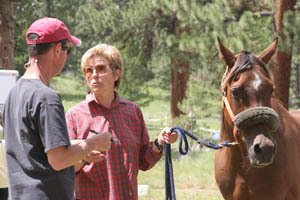 The Bandit Springs ride was put on again by Jannelle Wilde and her husband Adam Falke and a host of other worker bees and riders, including Gary Pegg the "Trail Diva" or "Bonsai Man". Janelle and Adam live 5 hours away, and they all arrive about a week early and get to work setting up, clearing and marking trails. 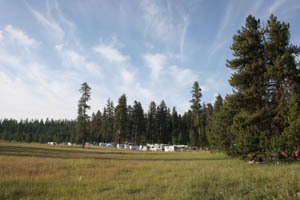 In the Ochoco National Forest on the east side of the Cascades in Ponderosa pine and fir forests, basecamp is in a large, knee-high-grass-meadow - much to the horses' delight - at 4700'. 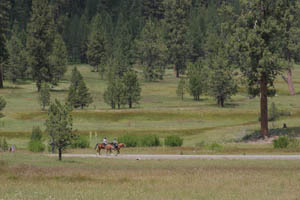 On the trails you might see wild horses, deer, elk, or antelope. You might get really lucky (or unlucky, depending on your point of view) and see a black bear or cougar, two of the elusive inhabitants of the Ochoco National Forest. You might see remains of 9500-year-old Native American camp lodges or 3000-year-old winter villages, or traces - such as tree blazes - of early pioneers, who traversed the Meek Wagon trail and Huntington Road in the 1840's and 1850's. And if you're really really lucky, you might discover the gold that bandits left hidden in the hills in 1863, along with their six horses. 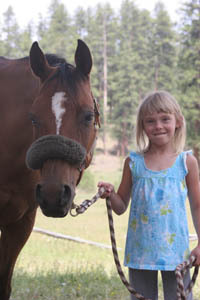 The bones and tack of the horses were found by the log they were tied to - but the gold was not... or so the story goes. The opinion of the mostly single-track trails through the forest was pretty unanimous: though there were "some rocks", and places were a bit technical, over all, the trails were great, "nothing to complain about!" Temperatures were in the mid-40's at night, and didn't quite reach 90* during the day. Last year's ride was a 1-day ride and had over 120 riders. This year's was a 2-day ride and had over 120 riders on day 1, and a large number again on day 2. It was my second year to cover the ride, and my second year NOT riding it... If I heard one more, "The trails were perfect!" "It's so beautiful out there!" "You should ride it!" I was going to rip the next person off their horse and gallop right on out there. So, hang tightly onto your reins and consider carefully what you say as you ride by me!